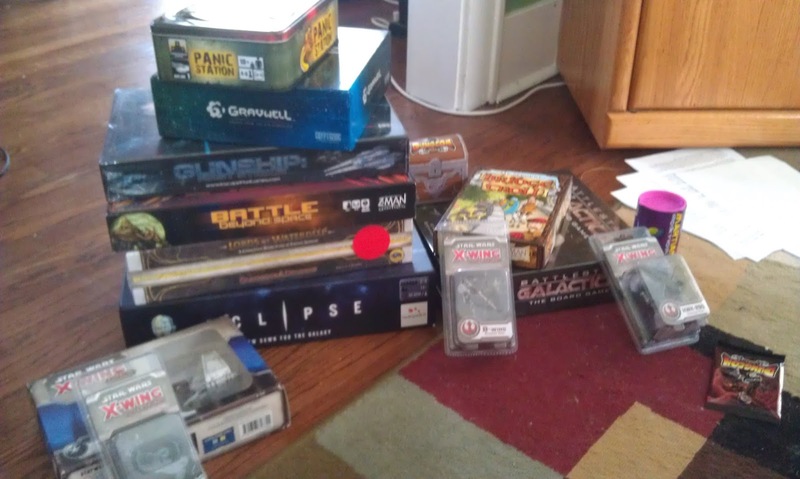 Yesterday, FarmerLenny wrote up his experience at Gen Con, primarily regarding the games he played. Now it’s my turn. I’ll talk about some games, but I feel that my experiences go beyond just playing a few demos, and most of the games I played were also played by FarmerLenny, so I don’t need to bore you with unnecessary details. It was definitely a wild ride, but not all of what happened was super fantastic, even though it tried to be. 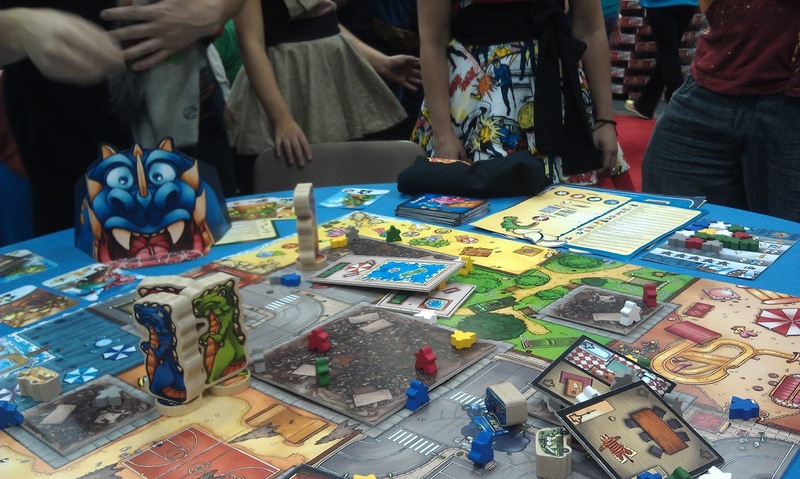 So, without further ado, here’s what happened at Gen Con. Something that is worth doing – and we do it every time we go – is to simply wander up and down every single row of the exhibition hall. It gives you a great sense of all the massive activity going on in the hobby, and the variety of games and events and all manner of geekery that is going on. We took a gander at many games without trying them out, saw artists and their art, and spotted Walter Koenig from a distance (My friend Blake was quite excited to see that he was wearing a Psi Corps hat – a reference to his character from Babylon 5 rather than Star Trek). The place was abuzz with energy. We made our first purchases at the Tasty Minstrel booth. Dungeon roll seemed like a decent pick-up-and-play dice game, and at $15 with a bonus pack of heroes thrown in, it seemed worth a purchase. We had a quick demo of the game which proved to be quite difficult to actually score a significant amount of points, which could be fun as a solo game when no one else is around. A time-waster, really, and that’s okay. Farmerlenny bought Rialto without even trying it – a bold move, I say – but as you read yesterday, he ended up rather liking the game. I’d like to think that my experience with Merchants & Marauders is what pushed me to the top of this pirate-themed cross between 7 Wonders and For Sale. Treasure Maps, they always lead to the best treasure, I say. Okay, this isn’t exactly my favorite type of game, but pirates are fun, and I could see something like this getting played with my family. You never know, it might go on the wish list. Something you always hope for when you go to a big con is competitive pricing on the games that are there. Unfortunately, it seems that the biggest publishers at the convention have some sort of embargo in place preventing other retailers from selling their products there. Of course this means that the publishers don’t HAVE to offer convention pricing, since no one else is competing with sales, which kinda stinks a little bit. Z-Man’s booth was fairly disappointing, with nothing in the way of discounts and they sold out of the Pandemic compatibility packs – which I had hoped to pick up there and save on shipping – very, very quickly. The worst offender, though, was a particular Rio Grande re-seller. This particular booth is at Gencon every year; in past years, competing booths have resulted in price wars and great discounts on Rio Grande games such as the latest Dominion expansions. This year, however, there was no competing Rio Grande seller (note: this booth was not a Rio Grande booth; Rio Grande maintains a room outside the exhibit hall with most of their games available for playing and NO BADGE REQUIRED, but there is always at least one kiosk on the floor that is selling RGG products). So, the RGG seller had some very “interesting” pricing. And by interesting I mean that games were tagged with sticky notes that had one price crossed off and another, lower price. The thing is, the “crossed off” price was in almost every case significantly higher than the MSRP, and while the “discount” price was much lower, it was in truth not much of a discount from the actual MSRP. In fact, some games had a “discount” price that was higher than the retail price. This is highly questionable behavior and I am really disappointed. 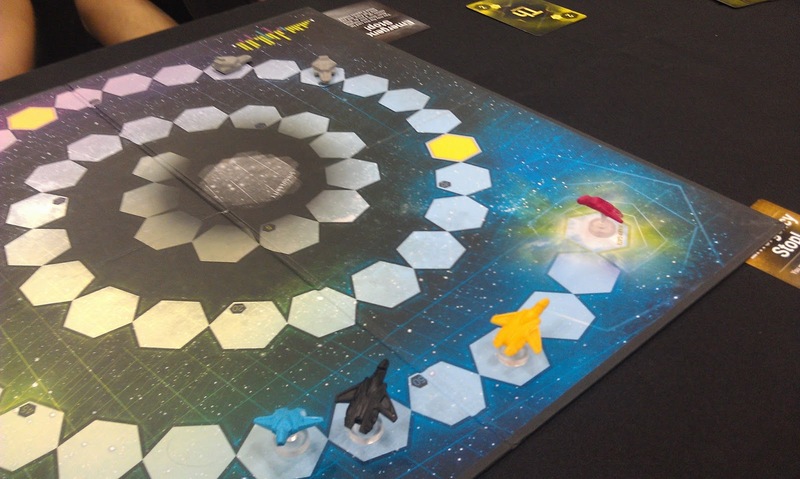 Gravwell was a game I hoped would be excellent and it turned out to be… excellent. It plays so quickly and is so easy to teach. and it looks beautiful. We had a chance to talk to the designer, Corey Young, who seems like a great dude. This is the kind of chaotic game that’s easy to love; enough strategy to make you feel somewhat in control, enough craziness to give you those hilarious “noooooooooooooo” moments. It doesn’t hurt that I remained UNDEFEATED at this game. I had wanted the chance to demo Eldritch Horror, but FFG demos are pretty long-winded and I wanted to get into the FFG store (which had quite the line). My buddy Blake managed to slip into a demo at just the right time, and he really enjoyed the game. It’s highly likely this will get added to our game group’s collection at some point, and I’m really looking forward to trying it myself. It certainly looks less convoluted than Arkham Horror, with a more epic feel to it and more story-driven gameplay. I just hope the full playtime actually clocks in somewhere between 2 and 4 hours, rather than the 5-6 of Arkham. Meanwhile, I jumped in the line for the retail store. The line was long but FFG was organized and it moved pretty quickly, giving me the opportunity to get my hands on the latest X-Wing minis – the B-Wing, Lamba Shuttle, HWK-290 or whatever, and the TIE Bomber. These ships are as beautiful as previous models and I am way excited to get these new ships and their upgrades into play. B-Wing has a Koigran turn at speed 2, Lambda has a 0 speed manuever, and the support abilities of the pilots and upgrades are fantastic. I have a feeling these ships will become staples of many X-Wing squads. 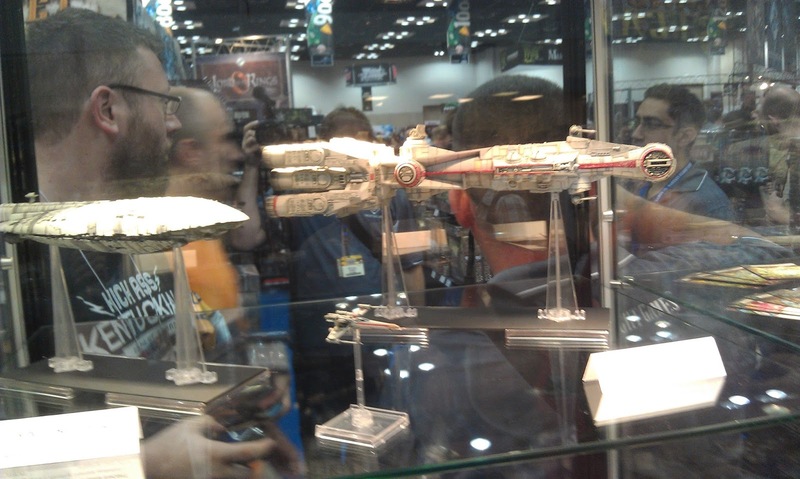 In case you missed it, some big X-Wing news was announced and I discovered it while waiting in line. Turns out the next round of new ships are “big” ships featuring a certain corvette and a rebel transport. Okay, so these aren’t exactly highly maneuverable dog-fighters, but I think the scenario implications are fascinating. The models themselves are beautiful, and quite large, requiring 2 bases. They also clock in at $59.99 for the transport and $99.99 for the Corvette, and from what I understand are not quite at the exact scale of the other miniatures. What does that mean for the game? I guess we’ll find out. As for me, I’m just hoping they’ll release a pack of upgrade cards, so we can get our hands on multiple copies of useful upgrades without killing our budgets on more miniature expansions than we really need. If you didn’t notice, Farmerlenny had long disappeared as we headed into FFG zone. Afterwards we hit up another non-Lenny game, Shadowrun: Crossfire. Shadowrun was the first RPG I got into, playing with friends in my buddies basement in this wildly exciting dystopian cyberpunk world with technology and magic mixed. Naturally, Blake and I were very interested in a card game version. It’s hard to be sure from a demo, but the game seemed pretty fun. As FarmerLenny mentioned, most deckbuilders just feel like minor variations on the Dominion scheme, but none do it better than Dominion already did it. What sets Shadowrun apart is the theme. There wasn’t much going on mechanically that was very revolutionary – although there was mention of a Risk-Legacy style system of “leveling up” your charaters by adding stickers to their character sheets after completing missions and earning upgrades. However, actual gameplay felt rather enjoyable – every character had different abilities and a unique starting deck, and tackling “obstacles” was challenging and cooperative. The system seemed very simple, easy to pick up and play, but thematic. Our mission was easy and we passed with little trouble; but it was designed to be a fast demo, and we were assured that full game missions were long and tough and would definitely result in the desperate, destructive circumstances so commonly found in Shadowrun games. I might actually try to pick this one up down the road. So, you may have seen me tweet on occasion about a game design that I am working on. 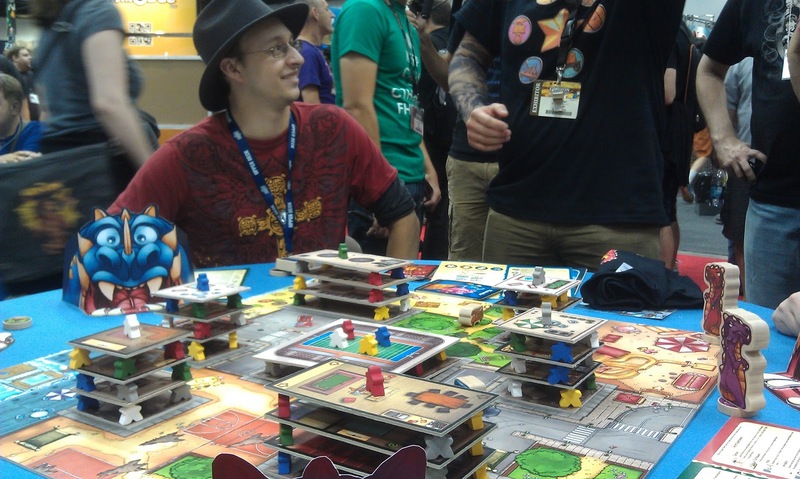 At Gencon I was able to meet up with a publisher and play the game with them. They did not take the game, but it was an interesting (and terrifying) experience as you watch someone you have never met before analyze every step of your game. I got a lot of great feedback, and soon I will write a full post about my game, the design process so far, and where I plan to head into the future. I wasn’t sure I was going to continue developing this thing, but after the feedback from the publisher rep and some ideas I came up with on my own, I think I might have some new ideas for the future. So, while I would love to have been picked up, it was definitely a valuable “first pitch” experience – and the guy did say he would be interested in seeing the game again, down the road, when some of the bigger issues were fixed. So that’s cool. Our car was packed full of game boxes on the way up, because both Farmerlenny and I had a ridiculous number of games trade in the Math Trade. So we headed down to the convention center early to get a close parking spot and unload our cart of games. Unfortunately it was at that time that I learned a very valuable lesson: never ever ever ever ever ever forget your badge. It was not a great start to the day, especially as we were staying at the house of a friend of mine who lived 20-25minutes away from the center. I missed being at the math trade in person but fortunately Lenny and Blake took care of everything. Not a great start to the day. Don’t forget your badge, people. This is the giant version of Rampage. At least, this is where it all starts. 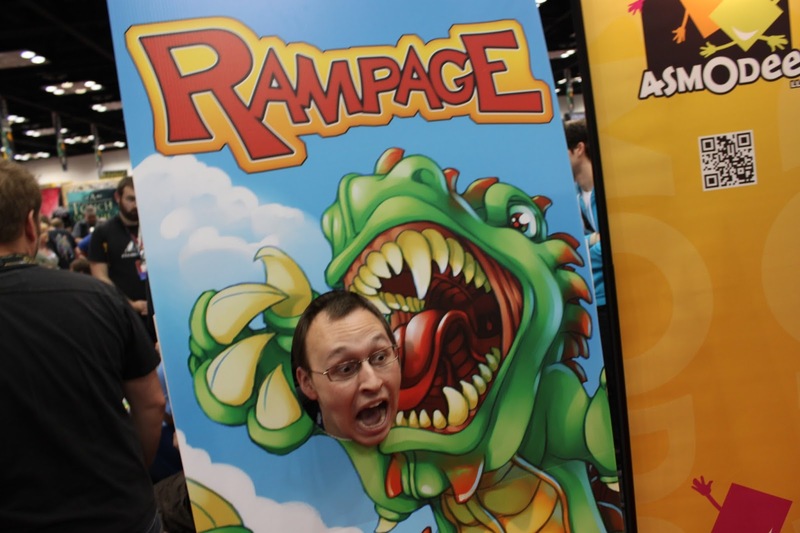 One of the biggest hit games at Gencon this year was a little game called Rampage. And of course by “little” I mean “enormous.” The game itself is not out yet – scheduled to be released at Essen – but Asmodee had a giant version of the game set up at their booth. There was always a crowd standing around but we held our ground and Blake and I managed to get a demo. 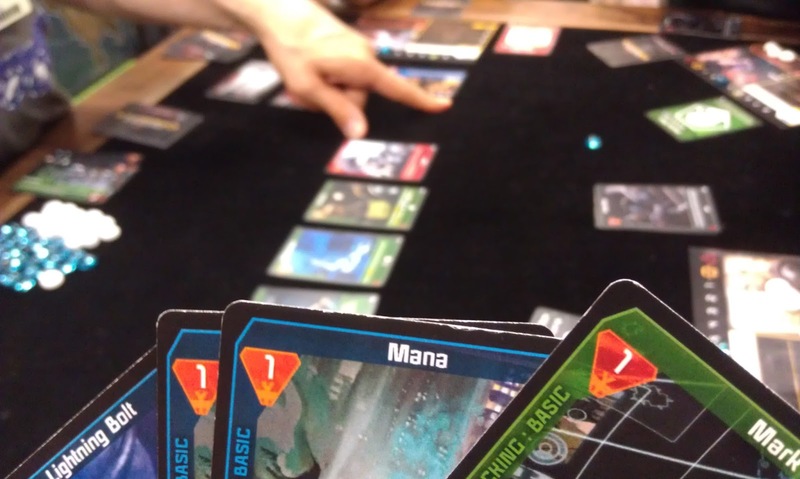 Quick overview of the game: think King of Tokyo combined with Ascending Empires combined with Angry Birds. 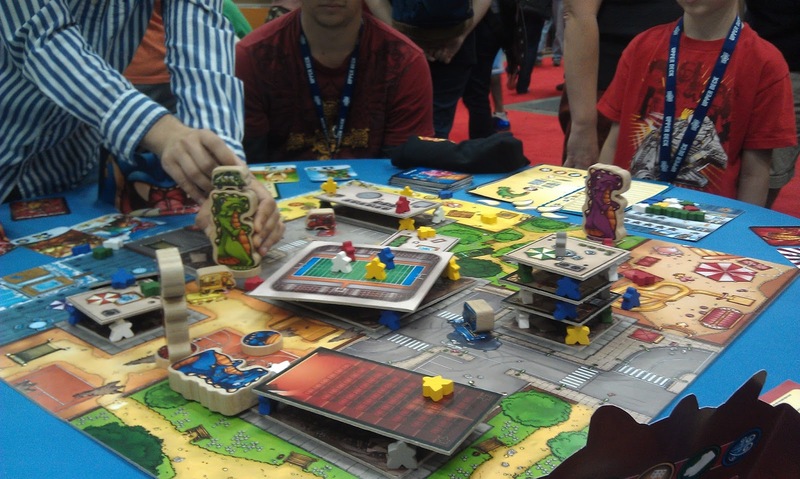 Players are dragons terrorizing a little city – an actual 3D city built out of meeples stacked on top of platforms. Just look at the pictures, it makes sense. Anyways, on your turn you can move (by flicking the disc base of your dragon around the board), crush a building you are next to (by picking up your dragon and dropping it onto the building), throw vehicles (by setting the vehicle on top of your dragon’s head and flicking it), and huffing-and-puffing (by putting your chin on your dragon’s head and literally blowing air as hard as you can). The goal is to destroy as much of the city as you can and eat as many meeples as you are able. You can eat any meeples that are lying on the “ground” in your section of the board, and you get to claim any building sections that have no meeples on top of them at the end of your turn. You can also knock other dragons over to take their teeth from them, which not only forces them to eat fewer meeples on their turn but the teeth are worth points. You also have to be careful about knocking too many meeples off the board completely, as you cannot eat those and they will also push forward certain troublesome effects against you if you trigger them. Points are earned by collecting sets of the 6 different meeple colors, destroying buildings, and getting teeth from your opponents, as well as certain special cards. This game was. Fantastic. It’s not a deep strategy game and not right for every occasion, but man was it a blast to tear apart the city. 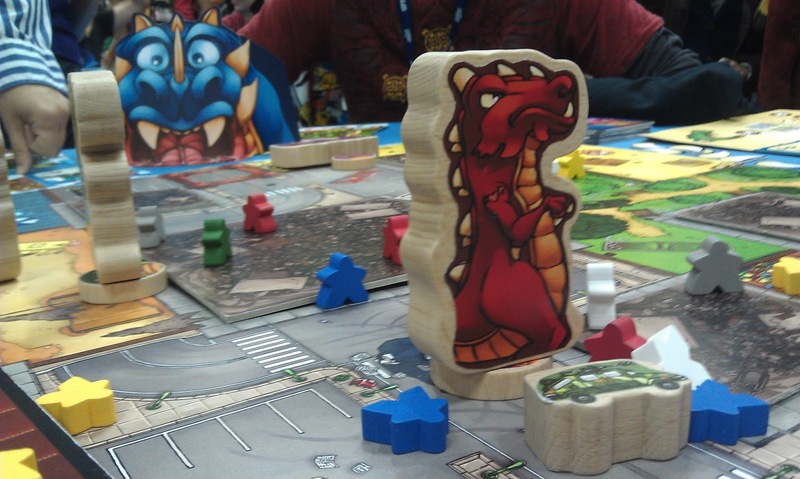 My dragon had the special power that I could move twice for every move action, so I used that to great effect to knock over the other dragons almost every turn, in addition to getting where I needed to go to eat meeples. In the end, I scored 41 points for the win and got a cool Rampage t-shirt. This was definitely the highlight of my saturday. My sturdy and superior RED DRAGON. Red was apparently my color for the con. This was also the beginning of the worst thing that happened to me at Gencon. “Uh… not personally…. I know OF him,” I said. His response to that contained some of the best words I’ve heard in my life once you put them all together. YES. Yes yes yes, 1,000 times yes. Near the beginning of my adventure into the world of tabletop gaming, when I first attended Gencon, I went to a panel featuring Wil Wheaton. Before this I only knew Mr. Wheaton as the kid who played Wesley Crusher, and as far as I knew he hadn’t done anything much since then. At the panel, I heard Wil talk about being a geek, about loving things, about playing board games with friends and family. This played a significant part in my assimilation into the board game world, into starting this blog, into launching into this hobby. Over the years since then as I’ve heard and seen more of him, my respect for him has grown. I’m not much for celebrity fawning, but he seems like a great guy, genuine, and it would be fantastic to meet him. Let alone play a game with him. C’mon! This was a dream come true. My face felt like it was going to explode. I told the Asmodee guy yes, I would definitely want to do that. They gave me the time and place to show up and told me not to flake out because then, obviously they wouldn’t have a full player count. The designer of the game, Antoine Bauza, would also be playing. Obviously I rearranged my plans, texted my friends who were at the ‘con, and felt extremely excited. Then, at 3:45 I showed up to Asmodee booth as ordered, and… no one was there. Well, the cashier guy was there but he didn’t know anything about the tournament. Other than yes, it was at 4. Another guy knew only slightly more, and he only knew who to call, but she didn’t answer her phone. I waited nervously, wondering what was going on, trying to assure myself that official people had officially told me I was officially in the game. Until finally, with the clock counting down, at last an Asmodee rep who knew what was going on showed up. And this was what was going on; a mistake had been made. There was a miscommunication somewhere along the line. Asmodee thought they were supposed to get people for the event. Only later did they find out Geek&Sundry (through which the event was taking place) had had some sort of competition and the winners of that competition were the ones who got to play in the event with Wil Wheaton and Antoine Bauza. Not me. As high as I had been flying 10 minutes earlier, I crashed into the ground. The Asmodee guy offered me a free game, fine, but that’s hardly a replacement. Not that Asmodee could do much about it; it wasn’t their event. As an introverted sort of person I needed to get out of the crowd, but this was Gencon and there is a crowd no matter where you go. Of course I was not lucky, but I WAS this unlucky. Had I never been told I would play with Wil Wheaton, it would not have been a problem that I didn’t. Even if I had entered a contest to play with Wil Wheaton and lost, it would not have been so bad. But I had been been told officially that I would, and then it was taken away from me. It certainly did not help that I had been left hanging. No one had met me to tell me the issue, no one from Geek&Sundry showed up to explain the problem. I had to scramble to find out what had happened and was finally met with excruciating news and it sucked, big time. It was awkward and embarrassing responding to all the texts about where I was and how had the game gone. I didn’t have the energy to do much more in the exhibit hall so I wandered aimlessly. The rest of the day hadn’t exactly been great and this made it all even worse. It ruined my Saturday. I was able to contact Geek&Sundry after the convention and explain what happened. I wasn’t sure they would listen, or understand, or care. Quite frankly, I expected something along the lines of “tough luck, bro, get over it.” Fortunately, their response was very understanding and sincere, and though they obviously couldn’t undo what had been done, they offered what they could, including an apology. I felt understood and respected, and that’s really all that I asked for. So, while I wish that I could have told a story about how I played Rampage with Wil Wheaton and Antoine Bauza, at least I can say that the situation resolved in a decent way. People make mistakes. I don’t like being the one getting the short end of the stick because of those mistakes, but what can you do? We resolved the issue as reasonable human beings and I have more respect for G&S and I really do believe they care about not just the community, but the individuals in it, which is what matters. In between lunch and the planned Rampage event that failed, I attempted to try Paizo’s new Pathfinder card game. I had decided to leave my friend Blake to the Firefly booth, feeling like the line and the demo would be too long to finish on time, which turned out to be to my regret as he texted me that they had finished the demo before I even got to the front of the line for the Pathfinder demo. 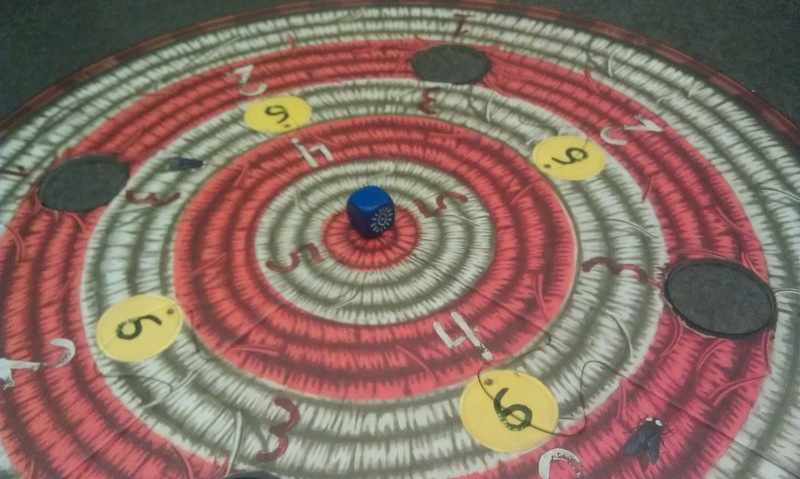 It did not help that I got stuck with a group of guys that spent a ridiculous amount of time asking questions about… the box, and how cards can be separated, rather than playing the game and finding out what it was like. The demo was supposed to be about 30 minutes, and 20 minutes after we sat down we just started the first players turn. Another 10 minutes later and I had to leave the demo to go to Asmodee before I had even had a chance to take a turn. It was a frustrating experience, so now is as good a time as any to remind all you readers of table etiquette: there are many many people waiting in line to demo games. There are many questions you can ask the sales staff rather than the demo staff, and it is just good manners to move your demo along swiftly so that more people get a chance to play more things rather than waiting forever and a day. C’mon, people. Keep the line moving. After the Rampage fiasco and an hour or so of aimless killing of time, I was finally able to get back with my group of friends and get some food. We spent the rest of the evening just playing games. We played an insanely long game of Martian Dice while Lenny read the rules to Dungeon Fighter. We had a blast playing Dungeon Fighter after that, which you probably read about in Lenny’s writeup. We played Rialto and Gravwell. 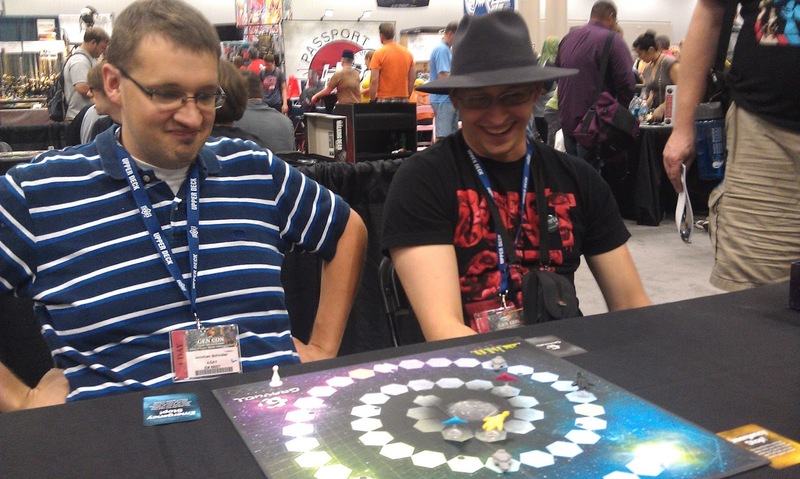 In the end, the most important thing, the most valuable time I spent at Gencon was just playing games with friends. It’s not too often we all get the chance to just game together for hours and endless hours. The best demoes were together with those friends, the best times were simply playing our games with each other. Despite the crappy Saturday afternoon, Gencon was overall a positive experience. I love gaming, and I love my gaming buddies. We played many games and saw many games and we have a lot to look forward to, but the hours we spent on Saturday night were the best hours I had at the con. Until next time, readers. Until next time. This just deepens my hope that next year’s Oak Park Microbrew Review is on a different weekend than GenCon! Is it possible that the French guy who asked if you wanted to play the game with Wil was Antoine Bauza, the designer? Here’s his picture: http://meepletown.com/wp-content/uploads/2011/08/bauza.jpg. I only ask because I can see it making sense if he was the one recruiting players; having random other Asmodee people doing so seems confusing. I’m sorry you didn’t get to play with Wil, but it sounds like you had a good time all the same! Alas, it was not Mr. Bauza. I saw him around. It was the guy running the Rampage demo almost all day long in the exhibit hall. He was also involved in the Rampage event with Wil Wheaton – I stopped by for a minute while it was going on, and he was there demoing the game. It was actually the guy in the above pictures with the tattoo sleeves… but his nametag is obscured by the whistle. I wouldn’t say he was a “random other Asmodee employee” since he was heavily involved in demoing the game. If Asmodee thought they were supposed to get people to play, it makes sense that the guy running the game would pick people out for whatever reason.